We’re about to explore deeper into the Wizarding World of Harry Potter and it’s about to get a lot more thrilling. 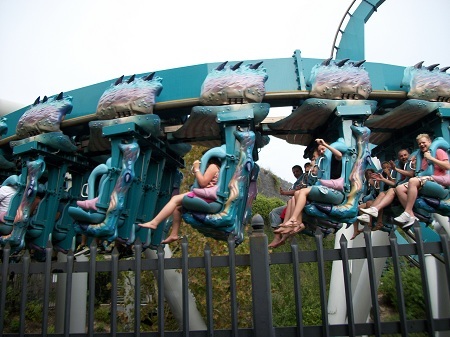 Join us as we embark on the Dragon Challenge, a jaw-dropping double inverted rollercoaster inspired by the events in the movie “Harry Potter and the Goblet of Fire”. Leading up to the ride itself, you will get a very good view of the rollercoaster, giving you an idea of what you are about to experience. You’ll see multiple loops and corkscrews as the two tracks intertwine with each other. There is a choice of which track you want to experience, the Hungarian Horntail or the Chinese Fireball, but both are equally thrilling. Also leading up to the ride, you might spot the Ford Anglia which was used by Harry and Ron to journey to Hogwarts and escape the Forbidden Forest. It doesn’t seem to be able to fly anymore, however, and appears to be stuck on a tree next to Hagrid’s Hut. The rollercoaster itself is quite intense and probably isn’t the best for people who aren’t rollercoaster fans. As you climb the rickety ascent, there is an immediate sharp drop and you will be entering a succession of loops throughout the ride. We went on it first thing in the morning and it was the best way to clear the sleep from our eyes! Suffice it to say, we were energised for the rest of the day. If people weren’t awake before the ride, they certainly were now! We’ll be making our way over to Hogwarts to experience Harry Potter and the Forbidden Journey. We’ll get to explore inside Hogwarts and meet some very familiar characters!